Below are a few selected pictures. Note that the cameras record the date, time, available light, and temperature. Clicking on the thumbnail takes you to the full size picture, which may not fit on your screen; scroll around to see the complete picture. 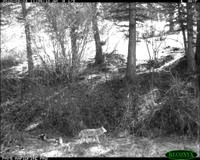 Carcass Site: A deer comes to inspect the carcass left by a mountain lion. 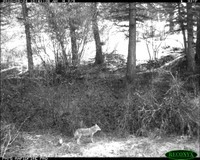 Carcass Site: A coyote wanders by. Carcass Site: He takes a rest. Carcass Site: Some time later, it appears he has disturbed the carcass. Creek Site: Not much activity here, just the occasional deer. 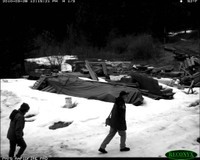 Storage Site: Professor Garrott follows a student during telemetry practice. 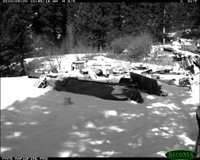 Storage Site: Gary tries to do some plowing to create better access to a potential burn site. Storage Site: A parade of elk passes along the right margin of the frame. Storage Site: A moose wanders by at night. 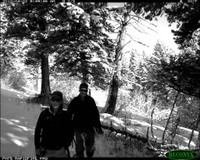 Storage Site: Gary and Pauline head up to inspect a potential burn site. 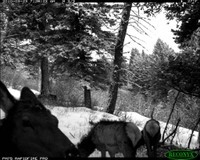 Mid-slope Site: An elk cow inspects the camera. 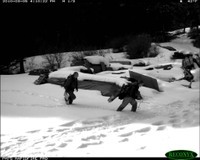 Mid-slope Site: Dr. Claire Gower and Dr. Robert Garrott come to collect the camera. 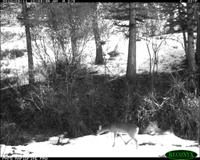 Ridge Site: A young 1x1 bull elk. Ridge Site: Lots of elk wander by. 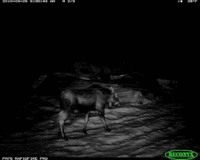 Ridge Site: This bull might be a solid 5x5 next season. 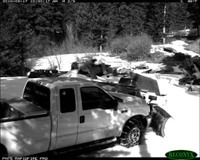 Ridge Site: Most of the elk were down lower during this snow storm. Ridge Site: Drs. Gower and Garrott come to collect the camera.